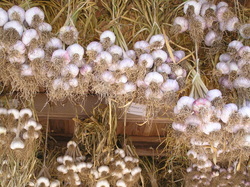 Every kind of garlic is unique in taste, flavor, secondary flavor and aftertaste. In order to try as many as you can to find the one you like best, sampler assortments are the answer. 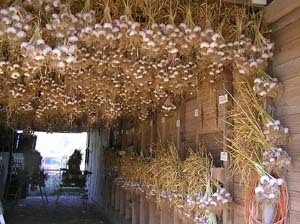 You can choose between an all mild sampler or an all hot/strong sampler or all hardneck garlics or all warm winter garlic for the south and west parts of the country or a gourmet sampler that has a little of everything in it for adventurous minded people. The sizes of bulbs used in the samplers are usually slightly smaller than prime in order to allow for as much variety as possible but still of good planting size. This is good for customers and growers alike. Sampler assortments usually cost a little more per pound because they are labor-intensive to select, package and send. It's worth it, though because it lets you try more kinds of garlic for less money than buying in bulk. If you order samplers from different growers, you will get different samplers, based on a grower's availability. 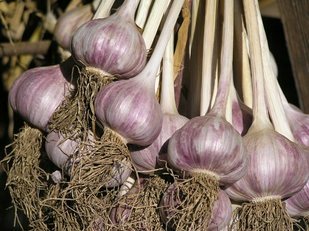 Softneck garlics do not contain a central stiff stalk called a scape but their necks (the part above the bulb) consists of only their leaves, making them more suitable for braiding. There are two kinds of softneck garlics, Artichokes, which were once called Italian Red garlics, grow well in warm winter areas and Silverskins, which are the longest storing and best braiding garlics. Typical Artichoke types are Applegate, Simoneti, Early Red Italian, California Early, California Late, Red Toch, Inchelium Red and Lorz Italian, among others and Silverskins may include, S&H, Silverwhite, Nootka Rose or Silver Rose or Mild French. - We Are currently accepting Online Orders for all-hardneck Sampler Assortments for fall shipment. Mouseover their pictures to see their contact information - click on their pictures to go to their websites to learn about them and buy from them.